Kava may be new to the West, but it's a social beverage and herbal medicine throughout Pacific islands. Read on to learn everything about this herb. Kava kava, also referred to simply as kava, is a traditional herb native to the Pacific islands, specifically the region of Melanesia. It holds great importance in many traditional belief systems in this area, and it is used in religious and political ceremonies. Due to the herb's effect on the body and its potential for use as a medicinal remedy, it is becoming more and more popular in the West as well. Managing stress and anxiety. Based on recent research, kava is thought to influence the brain in the same way as many popular antianxiety medications. Treating insomnia. Kava has had success in helping induce sleep in people suffering from insomnia. Kavalactones are the main compounds responsible for kava medicinal properties, particularly its sedative actions; some of the most active kavalactones are kavain, dihydrokavain, methysticin, dihydromethysticin, and yangonin. While the exact mechanism of kava's effect on the body is not yet known, it is thought that kavalactones induce states of relaxation by influencing gamma-aminobutyric acid (GABA) transporters and improve mood by affecting endocannabinoid receptors in the body. Other antianxiety medications affect the same systems, but kava properties does not appear to impair cognitive functioning. However, research into kava's properties has decreased because of kava's potential dangers to the liver. Popular herbs with sedative effects are lavender, lemon balm, linden, and passion flower. The safety of the kava or kawa kawa plant is undetermined, and there are a number of potential side effects. An allergic skin reaction, such as contact dermatitis, is common, and it is characterized by redness of the skin or a rash. Consumption of kava at recommended doses may also cause dizziness, drowsiness, restlessness, stomach upset, or tremors. Consuming larger than recommended amounts or using kava for extended periods of time may cause more severe conditions such as flaky, dry, or yellowish skin; hair loss; partial loss of hearing; or loss of appetite. Kava can cause serious liver damage if high concentrations are consumed, and there have been reports of liver failure occurring even after taking only the recommended dose of the herb. In the United States, the FDA has issued a consumer advisory warning of the dangers of kava. For this reason, kava should only ever be taken under the supervision of a doctor, and use of the herb should be halted immediately and medical attention sought if there are symptoms of liver failure such as fatigue, jaundice, abdominal pain, nausea, vomiting, or joint pain. Several medications may interact negatively with kava; these include alcohol, anticonvulsants, antianxiety medications, diuretics, phenothiazine medications (commonly prescribed for schizophrenia), levodopa (commonly prescribed for Parkinson's disease), and any medications metabolized by the liver. Additionally, kava is not recommended for those suffering from liver disease, depression, Parkinson's disease, or for those who are pregnant or breastfeeding. Kava should not be taken before surgery, as it can interact with anesthesia, and the anesthesiologist should be informed of any prior consumption of this herb. Because kava is a sedative, it should not be taken before operating heavy machinery or driving a car. Kava is primarily a medicinal herb, not a culinary ingredient. Typically, medicinal preparations of kava are made using the root, which is the part of the plant with the strongest health benefits. Raw. In many cultures in the region of Melanesia, to which kava is native, traditional use involves chewing on the raw roots to experience the mood-altering effects of kava. Tea. 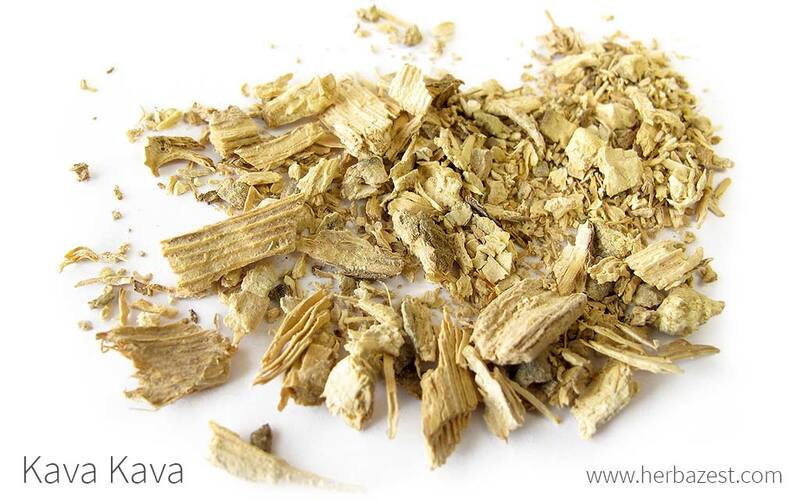 Traditionally, kava root is ground up and added to cold water, but it can be consumed hot like most Western teas as well. Kava tea is very effective at calming anxiety and inducing sleep. Powder. The powder made from kava root can be taken alone, but many people claim it is a more potent relaxant when mixed with hot water. Tincture. A few drops of kava tincture may be used for its relaxing properties. Extract. Similarly, drops of extract can be added to other food and drink and be useful for treating anxiety or insomnia. Capsules. Kava capsules are an easy way to benefit from the herb's antianxiety properties. Buying a kava plant may be difficult for those who live far from its native region, but it is still possible. The plant is widely available online, although buying kava seedlings from a local gardening store, if possible, is more reliable and the plant is likely to be healthier. Because kava grows in tropical climates, it tends to be available year-round. It is most likely to be found online, but it is possible that in some regions, especially those where kava is grown locally, it may be found at local markets and grocery stores. It is also likely to be found in herbal stores. It is important to be aware that kava is restricted or banned in many countries worldwide because of its potential to cause severe liver damage. It is currently legal to possess and use in the United States, but other countries have different laws regarding its use. Kava is a shrub that can take several years to reach maturity, and it requires a very specific climate, as well as plenty of care in order to thrive. Anybody wanting to plant kava in order to harvest it for their own use should be prepared to spend years caring for the plant before it produces any yield. Kava generally produces only sterile seeds, so it is most successfully propagated by root cuttings. Kava cuttings may not survive to grow into mature plants if they are planted outside initially; young plants have the best chance of survival if they are kept in pots indoors until two to three months after planting, when roots are well-developed. The best soil for the kava plant is very fertile, well-drained, with high concentrations of organic matter. Kava is very sensitive to salinity, so the soil should not be saline at all. Planting kava near the ocean may damage the plant because of the salinity of the ocean water. It is recommended to plant kava in full shade, or else in a place with frequently overcast conditions, as excessive sun can cause the leaves to yellow and the plant to produce a smaller yield. Temperatures between 60 - 80°F (20 - 27°C) and high humidity are required for a healthy crop of kava. Kava grows best in tropical regions, at hardiness zones 11 and above. Drought conditions are severely damaging to kava, often killing its leaves, so the plant should be watered frequently, possibly with a system of irrigation. The plant is likely to be ready for harvest three to five years after planting, when it has grown to a height of 6 - 10 feet (2 - 3 m). Kava is susceptible to dieback, anthracnose, and leaf spot. Pests that may infest the kava plant include borers, aphids, mealybugs, and armyworms. Kava is a hardy, slow-growing perennial shrub. It develops a stump from which several stems sprout. Typically, the plant grows to six feet (2 m) tall before growing wider and sprouting additional stalks. Its roots, which are the part most often consumed for herbal remedies, can reach up to 24 inches (60 cm), and its light- to dark-green stems are covered in raised spots. Leaves are wide and heart-shaped. Kava has several different names in the different places where it grows natively. In Fiji, it is called yaqona; in Hawaii, 'awa; and in Australia, among Aboriginals, it is called grog. Kava, or Piper methysticum, belongs to the Piperaceae or pepper family, which contains over 3,600 other species and 13 genera, including the popular P. nigrum, or common black pepper. Several cultivars of kava exist, distinguished by their appearance, the smell and taste of the beverage produced from their roots, and the effects of that beverage on those who drink it. The most potently sedative strain of the herb is called isa kava in Papua New Guinea and tudei kava in Hawaii - tudei for "two-days," which is how long its effects are said to last. Kava has a long history of use by people who live in the Melanesian region where the plant grows natively. Still today, the plant holds importance in religion, politics, and social gatherings. The Western world first heard of kava after the English explorer James Cook came across the practice of drinking kava in 1777. It has since become popular worldwide as a medicinal remedy. Kava first became of economic interest in the 1970s, when Fijian demand for the root generated its first mass exportation. Initially, Fiji was the herb's leading exporter, but by the 2000s, Vanuatu took the top spot. The International Kava Executive Council (IKEC) estimated its global exportation value at $200 million USD in 2012, and production remains strong today. In places where the kava plant grows - notably Fiji, Tonga, Vanuatu, and Samoa - it has been associated with several myths and legends. All of these places have notably similar origin stories to explain where the kava plant came from. In each of the stories, kava and sugarcane are both first seen sprouting from an important person's grave, and a rat becomes intoxicated from nibbling on the plant's roots. Kava also has religious importance in the countries where it is native. It is often ceremonially offered to ancestors, gods, and spirits as a sign of respect or a way to appease their anger and win favor. It is also thought to be a way to communicate with the supernatural realm. Personal care. Kava bioactive compounds can be found in a some cosmetics, such as haircare products. Although kava's safety has not been definitively determined, with a doctor's help, the herb may be useful for its medicinal properties. Its use as treatment for anxiety is particularly likely to be the subject of further research.